Posted On December 19, 2017 by Team iCynosure. Embracing motherhood 7 years ago for me was more about welcoming the unknown rather than giving up on the known. The frustration, the joy, the fear, the anxiety, the nervousness and a million other emotions were playing havoc with my already super active – raging hormones, and add to that numerous unanswered questions that popped into my head every second, I was a certified pregzilla. But once #PrincessHeer arrived, my life changed from a crazed roller coaster ride to a luxurious relaxed drive. Sometimes I sit and ponder what would have put me at ease during those crucial months and the one thing that surely makes way to my mind is a more approachable maternity team. Most traditional hospitals, including the one I was consulting with, treated me as a patient and I now know that being pregnant is not an ailment or an illness but a time for joyful celebration. Hence the most important thing that would put most pregnant ladies at ease would be a comfortable environment, attentive staff, and medical expertise. There has been a huge shift in the mindset of expectant mothers, who are now looking at pregnancy as a celebratory experience from the moment they test positive to the moment they have their babies in their arms. This thought process has put the industry too is regrouping and recognising this gap to cater to the ladies with world-class services and facilities. One of the pioneers in the segment who recognised this need early on, have gone on to set up Cloudnine, India’s leading chain of out-of-hospital, specialty maternity clinics. Since 2007, the team has launched its numerous clinics across India with the latest one being inaugurated by actress Shilpa Shetty Kundra and renowned neonatologist Dr. R. Kishore Kumar in Navi Mumbai, #NaviMumbaiOnCloudnine. At #CloudnineHospitals, the team believes that a child is life’s greatest gift and pregnancy is one of the most magical experiences nature can offer. This gift deserves to be nurtured and cared for, not just at birth, but for the entire duration of your pregnancy. Which is why they ensure each expectant mother the three C’s essential for embracing motherhood…. Clinical Expertise offered by the best in class technology and facilities, Celebration of the joyous occasion and Customer Satisfaction by constantly being available and attentive pre, during and post childbirth. Since inception the chain of specialty clinics have delivered more than 50,000 babies across India, emerging as a torch-bearer in managing pregnancy from conception to delivery. Apart from the regular pregnancy, gynaecological, neonatal, paediatric care they also offer advanced infertility care and numbers other workshops that will help prospective parents take a step closer to embracing their bundle of joy. 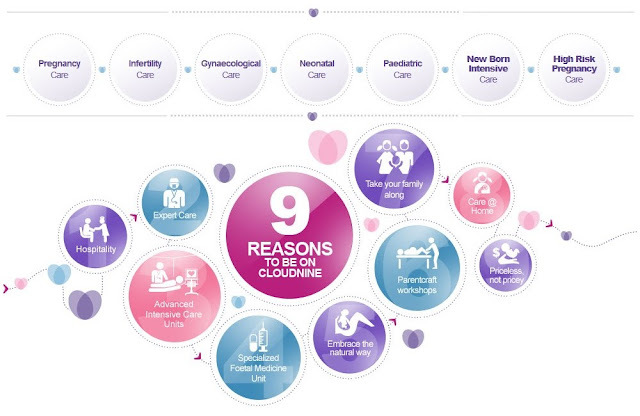 To know more about Cloudnine's facilities and services, click here.